If you have ever worked in SEO or tried to get SEO done internally at your company, you know that the challenges are plentiful. 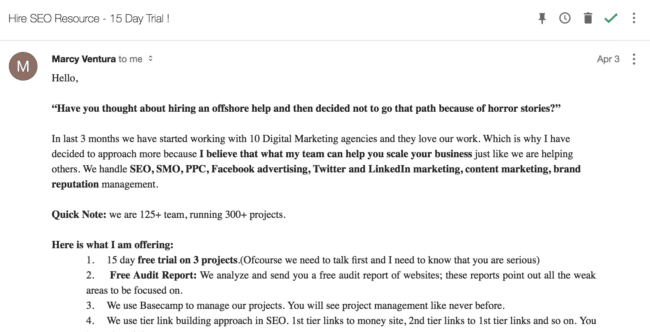 Maybe your head of engineering doesn’t value SEO and thinks all marketers are annoying. Maybe your head of product thinks that all they need to do is build a product that people love more and that’ll grow it. Maybe your executives have had a bad experience and are reluctant to invest any money. The challenges differ based on where the company, but at the end of the day even when all of the stars align it still feels like pulling teeth to get any reasonable amount of budget. Why does paid search get huge budgets while SEO teams struggle to get any decent budget? The business has short term needs that must be met before they can invest for the long term. It is a common lament from marketing consultants and in-house teams that they are unable to get the budget they need to grow. Sometimes this is completely fair – they could get more budget but it’s put elsewhere. Sometimes the person requesting the budget is asking for too much, which means that even if they are given less they still will not be happy because they didn’t get everything they asked for. The four reasons spelled out today cover both. One of the most common reasons I see SEO not receiving much budget is because SEO is not talked about in terms of business. You and I might understand what these mean and why they are important to SEO and getting better rankings and therefore driving more traffic and revenue from organic channels, but executives only care about the business case. Caveat: there are executives who claim that they care about links and duplicate content. I like to ask them, professionally, if that’s how they pay their staff. This helps them see that they actually care about revenue. SEOs who do not understand how their work fits into the bigger picture of business are doing themselves and their clients/employers a disservice. The reality is, we can get to a better picture of what SEO means to a business than where most currently go. We’re swimming in data – ranking data, traffic volume data, CPC data, conversion data. SEOs get access to everything, but we rarely use it to our advantage. If you build a better business case, then you’ll get more budget. The SEO world (really, the whole online marketing world) does not have a governing body and in some ways relies on a weird honor-driven community consortium to police itself. While this works well at the top level, there is a gross underbelly that somewhat often rears its ugly head and traps good businesses and good business people. SEO and much online marketing is also difficult to understand. When you layer on that it is quite technical, executives often have a hard time understanding it, understanding how to hire the right provider (we have a guide for that here), and understanding what they should expect. If you’re failing to get the budget you need even after building a solid business case around the opportunity and how your competitors are beating you in the search results, investigate if your executives may have had a bad experience with it before. This one is similar to the first reason, but different in a few unique ways. Your boss (or VP or whoever holds the budget power) has to understand where their spend is going in order for them to open it up. If SEO is an unproven channel in your business, then investing in it is putting their reputation and potentially job on the line. They’re not incentivized to grow audience and revenue usually. They’re incentivized to not lose traffic and audience. This is why it is much easier to get budget when something bad happens (eg you lose 50% of your traffic, so you get budget to get an audit done so that you can fix the issues) than it is to get budget to grow the channel bigger. Your boss might see the potential (since you followed reason 1 and built a business case), but they also understand that if you’re unable to deliver then they’re potentially in a risky position. You need to understand your boss’s motivations and where they want the business to go. If this is an owner, then it’s probably revenue. If it’s a marketing leader, then understand what they care about and then pitch your requests within that. You have to help them understand why investing in what you are asking for is a sound investment. This, of the four reasons mentioned here, is one of the most common and yet also more fair reasons I hear for not investing in SEO. I speak with businesses often who have shorter term goals and targets to hit than SEO can bring them. SEO is an investment. That is the best way I know to describe it. You have to get your technical base right, the right keyword strategy in place and content developed, and then you need an outreach and link strategy to earn the links that you need. Along the way you need budget and cooperation from other teams internally (or your clients) to get things done optimally. And as we all know, nothing is ever truly optimal. If you’re looking for a 2-4 month return on your marketing spend, then you’re likely better off putting that into Facebook and AdWords and other advertising channels before you invest in SEO. Realistically SEO takes 3-6 months to really see any forward progress, and often the real progress takes 9-12 months or longer. If your business needs to hit short term targets in order to last for the longer term targets, then SEO should necessarily be put on the backburner (though, not stopped completely) until a real investment can be justified. 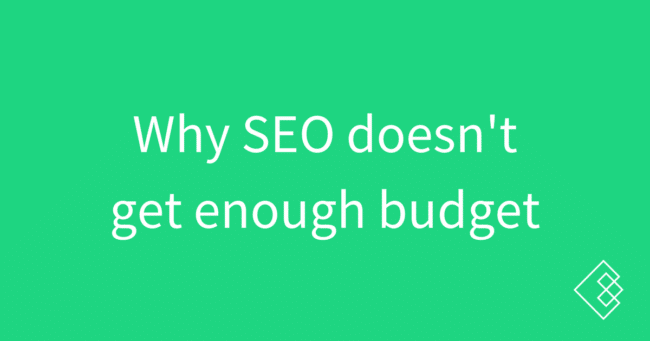 Why does SEO not get the budget we think it deserves? Sound off in the comments.